What actually happens when you format a memory card? It’s one of the first things you’re advised to do when using a new memory card, but what does card formatting do? And does it actually delete your images? But what exactly does card formatting do? And what happens to a card's contents when you do this? Here, we explain everything you need to know. Why should you format a memory card? Formatting a memory card is essentially a technological handshake between your card and your camera. This instructs the camera to set up a new file management system, which sounds complicated, but it's basically just the folders it needs to store any image and videos. The folder that contains images will typically be called DCIM, which is short for Digital Camera IMages, and this may have separate folders within it that are created as and when one folder has filled up to the numerical limit. They may also be created automatically when a period of time has passed from the last time you recorded anything to it. On some cameras, these folders are also where videos are recorded, although many cameras have a more convoluted separate folder that may be marked Private, and have many further folders within it. However these are labelled, by setting these up, it lets the camera sort all the information it needs to into a folder structure that makes some kind of sense. This structure is maintained, or expanded on, as you keep recording information to the memory card. If you get rid of these folders on a computer your camera should automatically create new ones on the next occasion that you use the same card in the camera, although it may prompt you to format the card again, which will appear to erase everything on the card. Does formatting a memory card delete its contents? No – at least, not quite. Formatting a memory card gets rid of any existing folder structure that was set up from previous use, and refreshes it with a new one that's specific to the camera you're using. So, you won't be able to access those images and videos through your camera, or through the normal way you would on a computer, as those folders are no longer there. The information on the card, however, may still be retrieved using image-recovery software. That's because it's still on the card, just not within the same folders as before. This is great news if you've accidentally deleted images or formatted a card that you intend intend to format, but there's no guarantee that you will be able to get these back successfully. But what should you do if you want to ensure a card's contents is gone for good? You may, after all, acquire a collection of memory cards that no longer work in a new camera, and want to pass them on to someone else. The only secure way is to destroy the card so that its contents can't be read in any way. This is admittedly extreme, but there are other options that you might want to try first to make possible retrieval more difficult. Canon suggests that you help to overwrite this information by taking enough images with the lens cap on until you fill the card. It has also offered a 'Low level format' option on many of its cameras, which it claims destroys any information on recordable sections of the card, which, in turn makes it it "almost irretrievable." How often should you format a memory card? As a general rule, it's good to get into the habit of formatting a card regularly than to simply delete images you don't need and continue shooting. 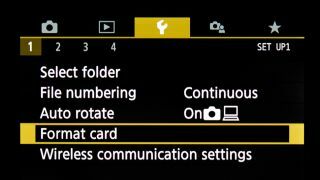 Regular formatting allows your camera to write information more efficiently to the card, so it's a good idea to do this once all the information on the card has been safely stored on a computer or hard drive. If you encounter card-specific error messages, you may be able to solve these by simply formatting your memory card – just make sure that anything you need on this has been copied somewhere first. If you're using an SD-type card, and your camera can't write any images to it at all, it's possible that the write-protect tab on its side has slipped down, so take the card out and move this tab back to its uppermost position before carefully re-inserting it.